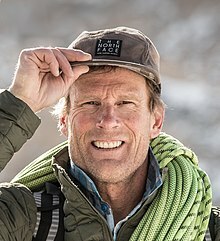 Conrad Anker (born November 27, 1962) is an American rock climber, mountaineer, and author. He is the team leader of The North Face climbing team. In 1999, he located George Mallory's body on Everest as a member of a search team looking for the remains of the British climber. He lives in Bozeman, Montana. 1987 Southeast Face Gurney Peak, Kichatna Mountains, Alaska Range, Alaska, United States. First Ascent (FA) with Seth 'S.T.' Shaw, Robert Ingle and James Garrett; summit attained May 8, 1987. 1989 Northwest Face Mount Hunter, Alaska Range, Alaska, USA. FA with Seth 'S.T.' Shaw, summit attained July 3, 1989. 1990 Rodeo Queen, Streaked Wall, Zion National Park, Utah, USA. FA with Mugs Stump. 1992 East Buttress, Middle Triple Peak, Kichatna Spires, Alaska, USA, 2nd ascent with Seth Shaw. 1992 Shunes Buttress, Red Arch Mountain, Zion National Park. FFA with Dave Jones. 1994 Badlands (YDS VI 5.10 A3 WI4+, 1000m), Southeast Face, Torre Egger, Patagonia. Conrad Anker, Jay Smith and Steve Gerberding (USA), FA 12 December 1994. 1997 The Northwest Face (V 5.8, 2100m), Peak Loretan, Ellsworth Mountains, Antarctica (solo) Jan 15-16, 1997. 1997 Rakekniven Peak, Queen Maud Land, Antarctica, FA with Alex Lowe and Jon Krakauer. Featured in the cover article of the February 1998 National Geographic Magazine. 1997 Tsering Mosong, Latok II, Karakorum, FA with Alexander Huber, Thomas Huber and Toni Gutsch. 1997 Continental Drift, El Capitan, Yosemite, CA, USA. FA with Steve Gerberding and Kevin Thaw. 1999 Mallory and Irvine Research Expedition, Mount Everest, Nepal / Tibet. 1999 Shishapangma American Ski Expedition, Tibet. Survived a massive avalanche which killed climbing partner Alex Lowe and cameraman David Bridges. 2001 East Face of Vinson Massif, Ellsworth Mountains, Antarctica. FA with Jon Krakauer. Featured on PBS series NOVA in February 2003. 2005 Southwest Ridge, Cholatse, Khumbu region, Nepal - summit attained with Kevin Thaw, John Griber, Kris Erickson and Abby Watkins on May 12, 2005. 2007 Leads Altitude Everest Expedition 2007, joined by Leo Houlding, Jimmy Chin and Kevin Thaw, retracing Mallory's last steps on Everest. 2nd summit. First documented free climb of the Second Step. 2011 Shark's Fin, Meru Peak, FA with Jimmy Chin and Renan Ozturk. 2012 Leads "Everest Education Expedition" with National Geographic, The North Face, Montana State University and Mayo Clinic - 3rd summit, this time without oxygen. With Cory Richards, Sam Elias, Kris Erickson, Emily Harrington, Philip Henderson, Mark Jenkins, David Lageson Ph.D, Hilaree O'Neill. Mayo Team - Dr. Bruce Johnson, Landon Bassett, Derek Campbell, Amine Issa. Base Camp Support Andy Bardon, Travis Courthouts, Anjin Herndon, Max Lowe. Anker has also climbed notable routes in Yosemite Valley (California), Zion National Park (Utah), Baffin Island (Canada), and the Ellsworth Mountains in Antarctica. Anker, Conrad (1988). "Gumbies on Gurney". American Alpine Journal. NYC, NY, USA: American Alpine Club. 30 (62): 69–75. ISBN 0-930410-33-5. Anker, Conrad (1990). "Hunter's Northwest Face". American Alpine Journal. American Alpine Club. 42 (64): 36–38. ISBN 0-930410-43-2. Anker, Conrad (1998). "With You in Spirit". American Alpine Journal. American Alpine Club. 40 (72): 140–145. ISBN 0-930410-78-5. Anker, Conrad; David Roberts (2001) . The Lost Explorer: Finding Mallory on Mt. Everest. New York, NY, USA: Simon and Schuster / Touchstone. ISBN 0-684-87151-3. Light of the Himalaya (2006). At the heart of the planet's most formidable mountain range live people who suffer from the highest rates of cataract blindness on the planet. The North Face athletes join eye surgeons from Nepal and America in hopes of making a difference. The film follows the doctors' work on the Himalayan Cataract Project all the way to the summit of a 21,000-foot Himalayan giant. The Endless Knot (2007). Directed by Michael Brown and produced by David D'Angelo, an HDTV documentary film with Rush HD and The North Face. In October 1999, Alex Lowe and Conrad Anker were buried by an avalanche in the Tibetan Himalaya. Anker barely survived the avalanche, but was overcome with survivor's guilt. In the months following the tragedy, he worked to comfort Lowe's widow, and eventually they unexpectedly found love. The Wildest Dream (2010), IMAX, directed by Anthony Geffen, Altitude Films, US distribution, National Geographic Entertainment releasing. National Parks Adventure (2016), a short IMAX film/documentary by MacGillivray Freeman about the National Park Service. ^ "Conrad Anker". Desert Island Discs. June 9, 2013. BBC Radio 4. Retrieved January 18, 2014. ^ Anker, Conrad (1988). "Gumbies on Gurney". American Alpine Journal. NYC, NY, USA: American Alpine Club. 30 (62): 69–75. ISBN 0-930410-33-5. ^ Anker, Conrad (1990). "Hunter's Northwest Face". American Alpine Journal. American Alpine Club. 42 (64): 36–38. ISBN 0-930410-43-2. ^ "First Ascent Info". Bigwall dot Com. Retrieved 6 February 2008. ^ Anker, Conrad; David Roberts (2000). The Lost Explorer: Finding Mallory on Mount Everest. Simon and Schuster. p. 100. ISBN 0-7432-0192-2. ^ Bjornstad, Eric (1996). Desert Rock: Rock Climbs in the National Parks. Evergreen, CO, USA: Chockstone press. p. 67. ISBN 0-934641-92-7. ^ "Cerro y Agujas del Cordon Torre". Climbing in Patagonia. Archived from the original on 20 June 2009. Retrieved 27 May 2009. ^ Anker, Conrad (1998). "With You in Spirit". American Alpine Journal. American Alpine Club. 40 (72): 140–145. ISBN 0-930410-78-5. ^ Krakauer, Jon; Wiltsie, Gordon (February 1998). "On the Edge of Antarctica: Queen Maud Land". National Geographic Magazine: 46–69. Retrieved 28 May 2009. ^ Huber, Alex; Thomas Huber (1998). The American Alpine Journal. American Alpine Club. pp. 34–42. ISBN 0-930410-78-5. ^ Schneider, Steve (1998). The American Alpine Journal. American Alpine Club. p. 187. ISBN 0-930410-78-5. ^ "The Himalayan Cataract Project team Summits Cholatste". MountEverest.net. ExplorersWeb. 12 May 2005. Retrieved 1 September 2009. ^ Coley, Mariah. "Shark's Fin Full Report". Retrieved 8 October 2012. ^ Potts, Maryanne. "Beyond The Edge".